Cthulhu has brought you a bouquet of cultists! He just wants to be loved, see how he’s baring his heart for you? This is another of the new illustrations for my Monster Heart Coloring Book. 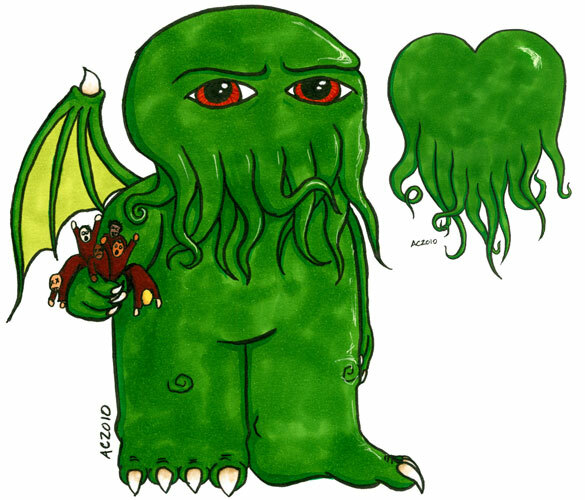 I couldn’t resist putting a Cthulhu in, and of course he’s also available as a Valentine. Cthulhu 3 and Cthulhu’s Heart, both 5″x7″ pen and ink and Copic markers on watercolor paper.